From left are Jody Christy, president, BOSS Snowplow; Brian LaBrash, board member, United Way; Joe Jaeger, controller, BOSS Snowplow; Debbie Peterson, board president, United Way; Diane Blaskowski, board member, United Way; Katie Schinderle, giving ambassador, BOSS Snowplow. 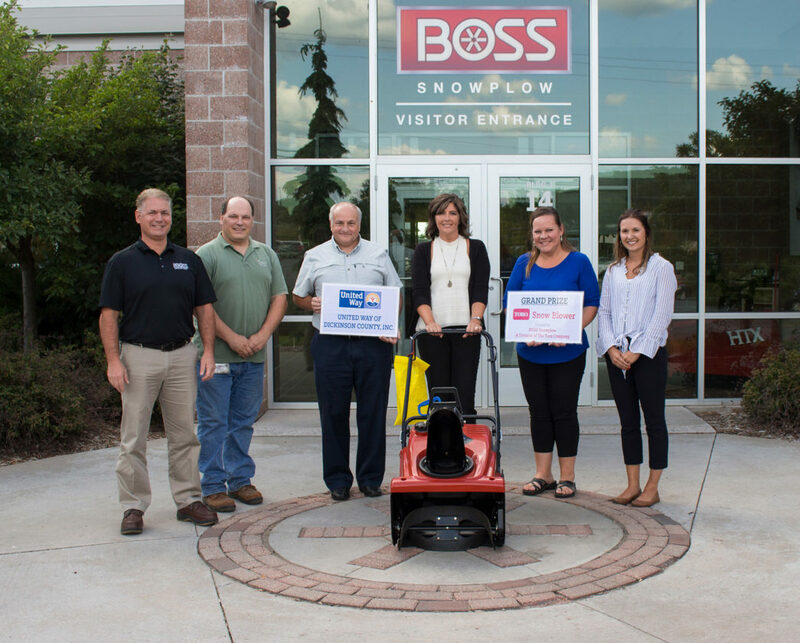 BOSS Snowplow is providing a Toro snowblower as a prize for the United Way campaign kickoff scheduled for 5 to 7 p.m. Tuesday at Pine Grove Country Club. IRON MOUNTAIN — In support of the United Way of Dickinson County’s annual campaign and kickoff event, BOSS Snowplow is donating $3,000 in monetary support to the annual campaign and a Toro Snowblower as a prize for the kickoff scheduled for 5 to 7 p.m. Tuesday at Pine Grove Country Club. The monies raised through the annual campaign and kickoff event support agencies serving the human health and welfare needs of the residents of Dickinson County and the surrounding area. In 2019, 16 agencies will receive funds from the campaign. Over half of the Dickinson County population utilizes one or more of the agencies funded by United Way. The goal for the United Way annual campaign is $138,500. Contributions can be sent to PO Box 429 Iron Mountain, MI. 49801. The United Way of Dickinson County began serving the Dickinson County area more than 40 years ago starting out as a Community Chest and Red Feather Organization before becoming known as the United Way. The United Way of Dickinson County was incorporated in the state of Michigan as a non-profit organization in 1987. The organization from its start has always been locally run with a board made up of local citizens who carefully oversee the administration of funds. United Way raises funds for agencies serving the human health and welfare needs of the area and assesses the community needs to avoid duplication of services to ensure needed services are provided.